With the rather volatile action in global equities over the past few weeks, it’s worth checking in on where market breadth is tracking. We take a unique approach in breadth analysis for global equities in that we look across a country-level rather than individual stock level. The benefit of this is that you can pickup early warning signs e.g. as certain groups of countries start to come under pressure e.g. as a result of some underlying macro issues. Aside from warning signs and risk management, it can also be useful in identifying opportunities, and this is well highlighted in today’s blog. 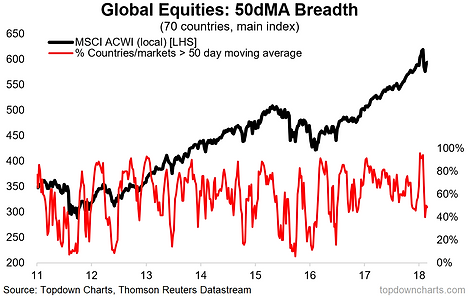 -50DMA country breadth looks to be giving an oversold signal. -On the “Death Watch” the proportion of countries with ‘death cross’ has tapered off after a previous steady increase. -On the bear market monitor, of the 70 countries we track, none have entered into a bear market’. -The lack of red flags lines up with our constructive macro/earnings outlook, so the oversold signal looks like a buying opportunity. 1. 50-day Moving Average Breadth: 50DMA breadth for global equities (across 70 countries) collapsed to oversold levels in the wake of the stockmarket correction (which sent the MSCI All Countries World Index in local currency terms down just over -8% top to bottom), and has since rebounded – usually a bullish signal. Interestingly this comes off the back of a classic bearish divergence which was initially resolved through a blow-off top.